There can be very few places in the world where woollen products are commercially made with every stage of the process being carried out by hand. 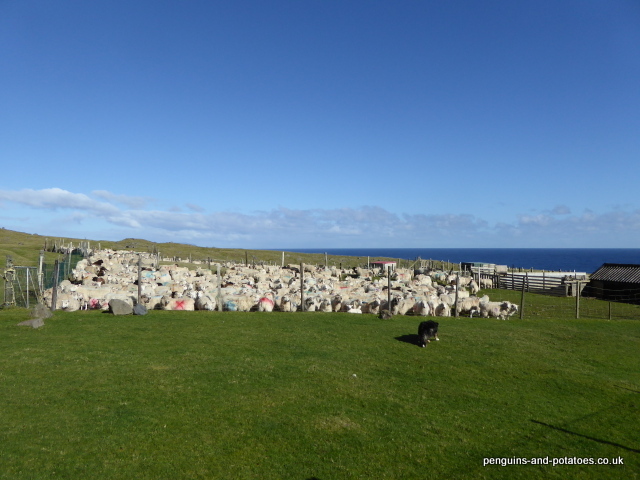 On the island of Tristan da Cunha, shearing is done using hand shears, and all the wool treatment processes including carding, spinning and knitting are done by hand. Sheep have been on Tristan since the early 1800’s. All the sheep are individually owned, but they are normally handled as one flock. It is the Agricultural Department that look after the sheep and carry most of the costs, taking care of all the routine treatments throughout the year, and one man from the Department attends to the ewes at lambing time. The owners of the sheep look after ear marking (each owner has his own pattern of cuts that are made in the ears for identification) and shearing, and finally the owner looks after the slaughter and butchering of his own animals. A whole lot of woolly jumpers! The flock has resulted from the importation of a number of breeds over the years. The main breeds in evidence in this mixed flock are Scottish Blackface, Cheviot, Suffolk, Carrodale, and a recent (but not too successful) addition of Dorper. We are currently making all efforts to introduce another importation of ‘new blood’ into the flock, this time hopefully bringing in Cheviots by using AI. We have come to that choice because the Cheviot breed is known for being hardy in marginal conditions, with a good carcase and with good wool quality. Wool is often seen as a by-product of the sheep industry. Around the world, in these days of artificial fibres, wool no longer has the importance that it once enjoyed. It is difficult to imagine how important wool was for the early settlers on Tristan, since they had so little contact with the outside world and no other means of producing clothing to help them through the cold winters. Shearing takes place in December, or sometimes January. 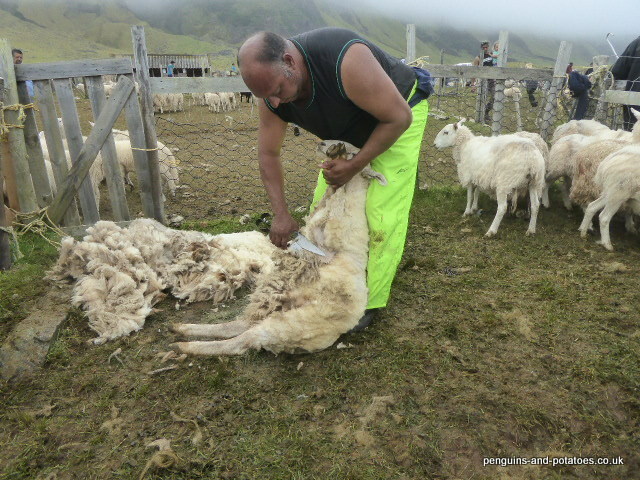 Shearing takes place with pointed hand shears, the same sort of shears that shepherds around the world use for local clipping around the sheeps’ tails. The annual community event called ‘Shearing Day’ has already been covered in a previous article. The wool is generally packed tight into recycled plastic sacks, and taken home to be stored in islanders’ garages. 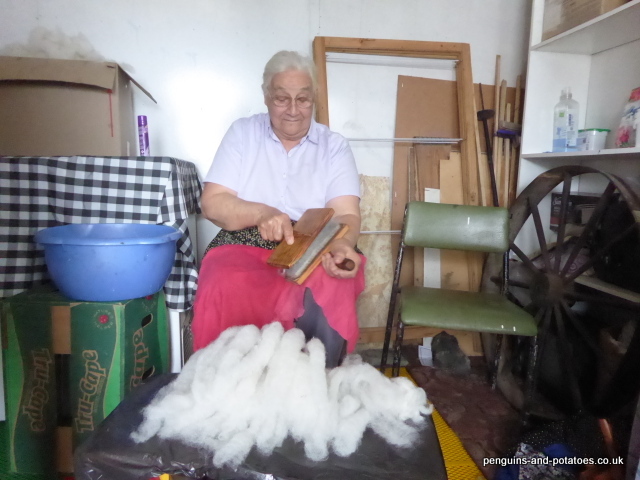 The work required to turn the bags of raw wool into a yarn that can be used for knitting takes a number of stages, all of them carried out by hand. 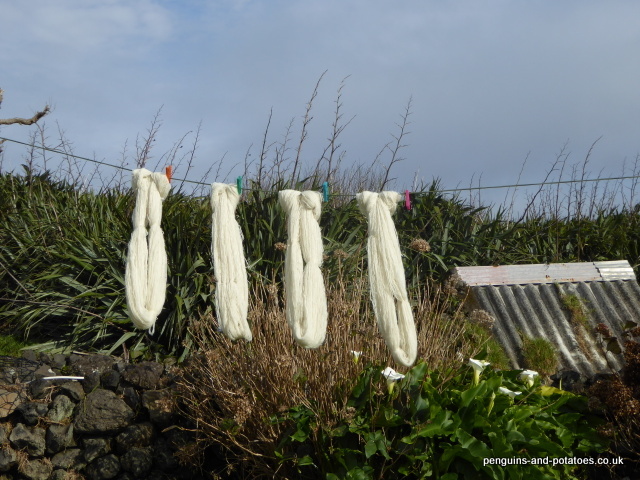 Firstly the wool is washed. Once the wool is dry, it is picked over, this task being done to start pulling out the fibres, to separate the clumps into smaller pieces of wool and at the same time to discard foreign bodies and pieces of marker paint that were used to mark the sheep for identification. The next stage is perhaps a bit unexpected – the wool has a trace of cooking oil added to it and mixed into the pile of pieces. This oil allows the wool to flow better in the following two stages. Carding and then spinning come next. In the carding process, two cards are used – these are like wooden paddles which have on one face hundreds of little wires protruding from the surface. The fibres of the small pieces of wool are pulled out, untangled, and left in loose spirals of fluffy wool by the skilled use of these cards, one the wires of one card being pulled against the wires of the other one. The fluffy spirals of wool are then spun into yarn. 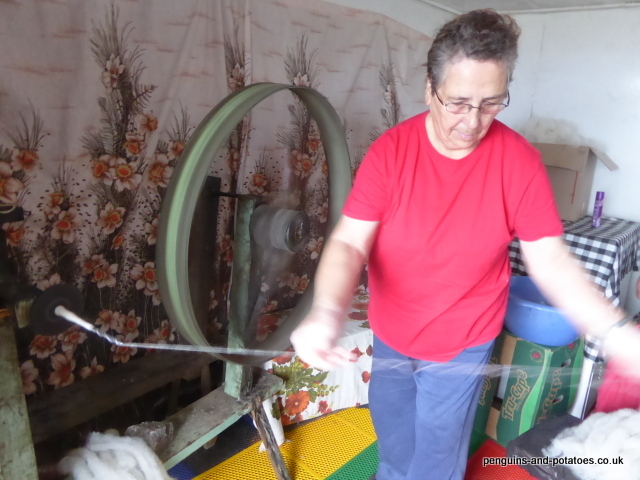 Many of the ladies on the island use locally-made spinning wheels that are rotated by hand and that use the momentum of the wheel to power the spinning of the fibres together, although some treadle-powered wheels are also used on the island. The yarn coming from the spinning is then doubled up, two pieces of thread being spun together by using the spinning wheel in the opposite direction. The fully formed woollen thread is then wrapped up in a skein, which is then once again washed to remove the oil that was added some five stages ago. After drying the skeins, the wool is then rolled up into the familiar balls of wool that we all know knitters to use. The knitting skills that some of the islanders have need to be seen to believed. I have seen one of these speedy knitters working away at a speed that seemed to be impossible, with only occasional reference to some scribbled pattern notes on a scrap of paper. Yet she was working on a complex garment with the words ‘Tristan da Cunha’ built into the pattern, and she held a conversation at the same time! 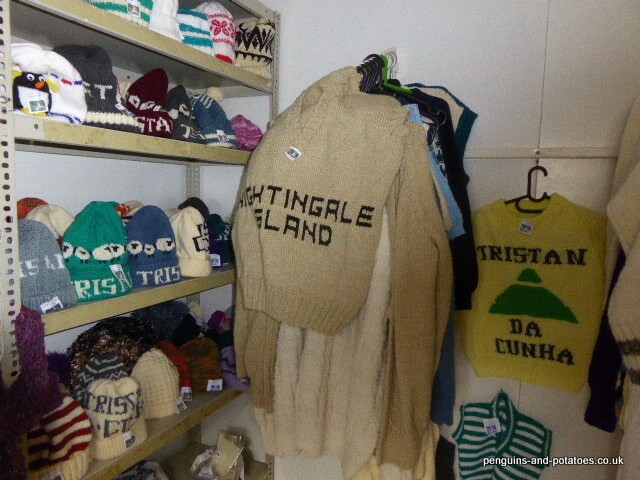 The range of products that are made by the island knitters includes sweaters, socks and woolly hats. Sometimes they are made as a gift to family or friends, (here or overseas), sometimes they are made to order, and sometimes the more standard items are made for stock, to be sold perhaps to visitors to the island who may be expat staff or tourists from one of the occasional cruise boats or navy ships that come to visit. They are also available by ordering via the web site, http://www.tristandc.com/handicrafts.php . If you order a garment, you must of course be prepared for a long delay while the item is made for you and while the long process of shipping to Cape Town takes place. But you will receive a high quality hand made item that probably has no equal anywhere. Who will make the garment for you? A register is kept by the ‘Tourism Department’, and in true Tristan fashion they rotate the ladies that they ask to produce each particular order. Believe it or not, out of a total population of 260 people, nearly 50 ladies are on the register. This gives a clear picture of the importance on the island of the cottage industry of knitting. I heard your recent interview on BBC Radio 4. Your perceptions echo those that my mother brought back from Tristan da Cunha after spending about eighteen months there on a church retreat in the late 1990s. I still have socks she knitted from the local wool, and also a painted penguins egg. She passed away last year, but some of the islanders might remember her. Her name to us was Lorna Ross, but she sometimes chose to use the name Catherine Fyvie. I would like to send my best wishes to you both and to anyone there who knew her. Has anyone ever considered Icelandic wool? Icelandic sheep are the same breed that Norse settlers brought with them from Norway in the 9th century. Brilliantly adapted to harsh conditions I would have thought they ought to fare well on Tristan. Read up on Icelandic wool on the Web. Amazing to hear that the islanders are still using all the same techniques I saw in the 50s when I was a child on the island!